But there is no evidence that the cave over which the church is built was Joseph’s workshop. Even if this is the site of the Holy Family’s home, the cave is unlikely to have been a carpentry workshop in the modern sense. 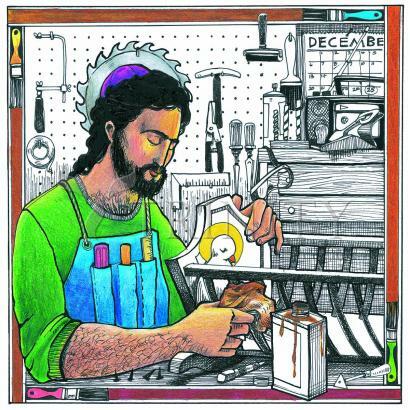 The Gospels use the Greek word tekton, meaning builder or artisan, to describe Joseph. He most likely worked with both stone and wood, since stone was the common building material in the area. Joseph’s work may have taken him away from his home. A likely place of employment was the Roman city of Sepphoris or Tzippori, which was being rebuilt by Herod Antipas at the time the Holy Family arrived from Egypt. The building site was a 50-minute walk from Nazareth.